Thanks to all who joined us for our virtual conference the afternoon of Tuesday, February 21! See the full conference playlist below, or get resources and see individual sessions further down the page! Welcome everyone to this afternoon’s Making in Michigan Libraries Virtual Conference! My name’s Ben Rearick and I’ve been a research assistant on this project for over a year and a half. We travelled around to 8 different community libraries this past summer, and we’re very lucky to see most of them represented here today. 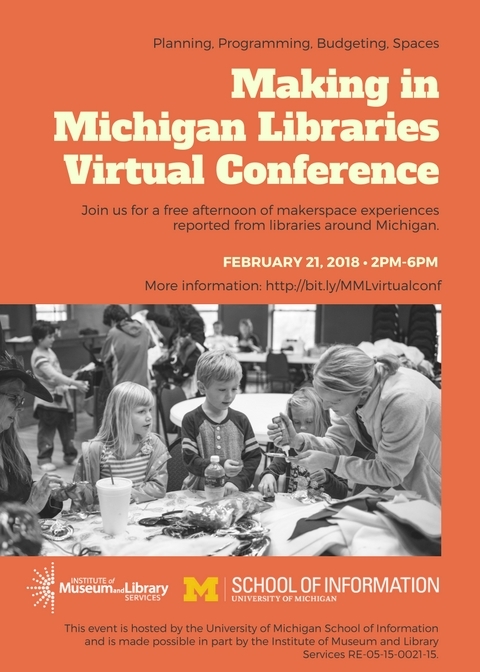 We’re very grateful to the Institute of Museum and Library Services grant RE-05-15-0021-15 that has funded this project for the past nearly 3 years, and makes this virtual conference possible! We’ll be monitoring the questions from the University of Michigan School of Information in the chat window, which is there on the right of your screen under the speech bubble icon. You can feel free to type your questions there and Kristin Fontichiaro and I will answer what we can in the moment, and be providing links mentioned by the speakers as well. We’ll then move to questions in the last quarter hour, where I will pose your questions questions to the presenters. Feel free to keep the questions coming throughout! Finally, we’re so grateful that we could have such a diverse range of librarians here to discuss their journey through this idea called the maker movement and how it takes different forms in every community. We’re so excited about the unique aspects each presenter brings to the table, as well as the focus on the often neglected small and rural libraries from which a majority of our presenters come. We hope you learn a lot today and archives will be made available in the coming three days, including Kristin’s wrap-up of major themes from the end of the conference! Let’s get started — take it away, Pete! Access the Chat Transcript here, full of helpful links to resources! The following two presentations with Q&A are all wrapped into one video. Laura’s session starts around 14 minutes in!